Fetlar is one of the 100 Shetland Islands which lie at the "cross roads of the North Sea", roughly equidistant between Scotland, Norway and the Faroe islands. Within Shetland, Fetlar lies to the South of Unst and to the East of Yell, its two larger neighbouring islands. Together they make up the three "North Isles" of Shetland. 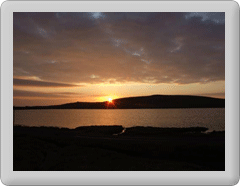 Although Fetlar is the fourth largest island in the group, it has one of the lowest populations. While initially seeming to be very isolated it is not as difficult to reach as you might think. Loganair operates several daily flights to Shetland from Aberdeen, Glasgow, Edinburgh and Inverness, and Northlink Ferries operate daily ferry sailings from Aberdeen. Flybe also provides flights but these are to be withdrawn , with their last flights planned for 7th January 2018. Once in Shetland, an excellent road network and frequent inter-island ro-ro ferry sailings mean that your journey to Fetlar does not take too long. With careful planning you can all but eliminate having to wait at the inter-island ferry terminals. You can also travel to/from Fetlar by bus which is a very afforavle option, but connections are limited.